The infirmary in the Operndorf Afrika consists of an emergency room, a maternity ward, a pharmacy and a dentist’s praxis and disposes over attached residential housing for the staff. The facility was opened in 2014 and offers around the clock access to medical care for the region. The general health care in Burkina Faso, especially in rural areas, is below the prescribed standards of the World Health Organisation WHO. Prior to the construction of this infirmary, a field study was conducted in the Operndorf Afrika, with the private Witten/Herdecke University, from North Rhine-Westphalia. This attested an alarming general state of health of the general public and this was often already at a childhood age. The target group particularly frequently, exhibits worm diseases and an increased number of diseases caused by parasites. Children are in proportion, more often affected than adults, by the parasites. Under nutrition and malnutrition was ascertained in the case of the majority of the children. In addition, they exhibited an above-average proportion of periodontal diseases, which can also trigger system disorders. The dental treatment of diseases is important and long-term educational work in dental hygiene is essential, particularly with regard to periodontal disease. The case study showed that what is basically lacking in the general public is the diagnosis of diseases and its prevention. The team of doctors from Witten advised the Company Festspielhaus Afrika gemeinnützige GmbH, in the design of the health facility. It was as such possible to design a healthcare facility pursuant to the international standards of WHO, which is perfectly adapted to local needs. 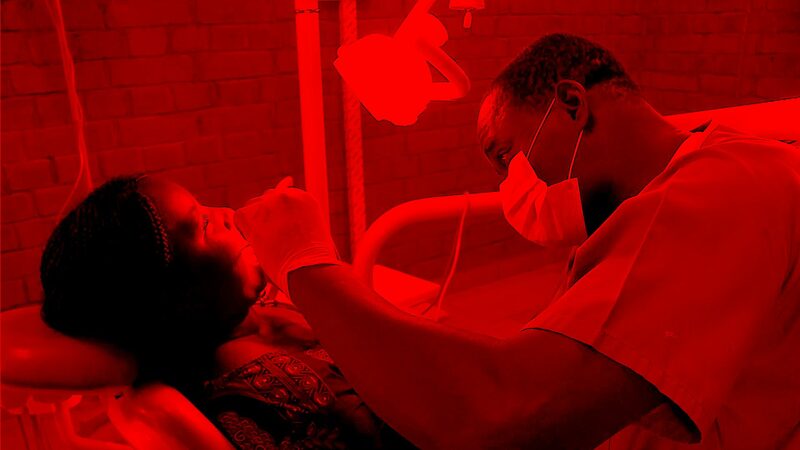 Furthermore, one reacted to the lack of treatment options for the dental suffering in the region, with an appropriate specialisation of the infirmary. In addition to the standard offer of the outpatient and the maternity ward, a “Cabinet Dentaire” was set up and a dentist recruited. The station disposes over a mobile treatment suitcase and a “Moto Ambulance” (patient transport vehicle), which makes it possible to treat patients in their villages. The architectural design from Francs Kéré has created an infirmary, which, alongside the spatial separation from disease and birth, has the social proximity of the general public as its focus. A special concept comprising of connected, leafy courtyards creates spaces for being together and supports the ventilation of the system. Read more about the architectural concept here. One of the main concerns of the facility is to work preventively and to not only provide training in dental hygiene, but concomitantly also information sessions on family planning, birth preparation, diagnosis of diseases, nutrition and on relevant vaccination. Health education also takes place in the Operndorf School, embedded in school life in the form of washing hands before lunch, as well as the common brushing of the teeth thereafter. The infirmary offers a first contact point, in the rural area around the Operndorf Afrika, since mid-2014. It relieves the district hospital, located four kilometres away, as well as supports it in the form of the jointly conceived care programs. Most especially women in the region, who have hitherto had to give birth at home, now receive birth assistance as well as primary medical attention for their children. With the opening the infirmary on 7 June 2014, the facility was transferred under the aegis of the Burkina Faso health authority. Unlike many other aid projects, this infirmary is supervised by a group of doctors from Burkina Faso, within the framework of a sustainable and holistic approach of the project, as well as financed by the government of Burkina Faso. Measures of health education, which go beyond the government’s budget, are financed by donations.